Esophageal cancer, which is one of the deadliest but least studied cancer, ranks sixth in mortality among all types of cancers . Although various strategies have been developed, surgery is still the main treatment of patients with esophageal cancer . Gastroesophagostomy, which refers to the surgical anastomosis between esophagus and stomach, is widely used in the surgical treatment of esophageal cancer . However, clinical application of gastroesophagostomy is still challenged by the high incidence rate of postoperative complications, including anastomotic fistula, anastomotic stenosis and gastroesophageal reflux [4,5]. Previous studies have shown that gastroesophageal anastomosis plays a pivotal role in preventing the occurrence of complications after gastroesophagostomy [6,7]. A recent study found that esophageal anastomotic tension was closely correlated with the development of gastroesophageal reflux . However, based on our clinical experience in our hospital and previous studies, incidence of anastomotic fistula, anastomotic stenosis and gastroesophageal reflux is high after traditional gastroesophageal anastomosis, and almost 40% of the patients will show different degrees of gastroesophageal reflux after surgery . The unacceptable high incidence rate of complications significantly increased the number of deaths caused by esophageal cancer. Therefore, the development of a more efficient gastroesophageal anastomosis that can cause lower incidence of complications is always needed. To this end, Geng’s treatment for gastroesophageal anastomosis has been developed in our hospital. With Geng’s treatment, gastric stumps were putted into the cavity of tubular stomach, which in turn reduced reflux. Case studies on patients with different degrees of esophageal cancer have shown that Geng’s treatment is positively correlated with the better treatment outcomes compared with the traditional method. In this study, incidence of complications caused by Geng’s treatment and traditional treatment were compared. We found that Geng’s treatment significant reduced the incidence of anastomotic fistula and gastroesophageal reflux. The report is as follows. A total of 310 patients with esophageal cancer were selected in our hospital from February 2016 to November 2016. There are 160 males and 150 females, and the age range from 28 to 74 y with an average age of 45 ± 7.8 y. Inclusion criteria: (1) patients with esophagus squamous cancer confirmed by endoscopic biopsy, (2) preoperative clinical staging cT1-3N0M0, (3) with satisfactory function of major organs that can tolerate surgery, age<75 y, (4) distant metastasis was excluded by physical examination, (5) without a history of malignant tumors. Exclusion criteria: (1) combined with other diseases that cannot be treated with surgery, (2) with estimated life-expectancy of no more than 1 year. This study was approved by the ethics committee of our hospital (AZLL022015006151201, 12/01/2015), and all patients signed informed consent. The 310 patients were divided in to traditional treatment group and Geng’s treatment group according to their willing and physician’s recommendation, 155 patients in each group. No significant differences in basic information, including age, gender, weight, severity of disease etc. were found between those two groups. Patients in Geng’s treatment group were subjected to following surgical treatment: after general anesthesia, a double lumen endotracheal tube was intubated through left chest, neck, right chest or abdomen. Esophagus and stomach were treated with traditional method and lymph nodes were expurgated. Gastric tube was made using a closer 3.0 cm away from cardia, and blood supply to the greater curvature of stomach was retained. After suturing, gastric tube was lifted along original esophageal to neck incision, and 5~6 cm of gastric tube at the distal end was kept beyond the chest outlet. The position of the cephalic side of esophagus was adjusted and esophageal wall was clamped. Esophagus was opened and a nail holder was placed (a proper anastomat was used to avoid mucosal and muscle damage). Gastric torsion was avoided. A 2.0 cm transverse incision was made on the anterior wall of the stomach, and a suction device was used to remove the stomach contents. The host header of anastomat as inserted and the host connecting rod was pierced through stomach wall at the area without main blood vessels to connect to the center rod of nail holder. 1. Stomach pulp muscle and esophageal root muscle were sewn for 1 stitch at the left, middle and right part, respectively (Figure 1A). Anastomat was then used to match stomach and esophagus. After that, the integrity of tissue around gastroesophageal anastomosis was checked. Figure 1: Procedure of Geng’s treatment for gastroesophageal anastomosis observation indicators. 2. Gastric and vegetative tubes were placed through thoracic incision, gastric stumps were cut out and stomach was fixed at both left and right sides using absorbable thread (Figure 1B). 3. Stomach pulp muscle, esophageal stump muscle and surrounding tissue were sewn for 1 stitch at the position with a distance to gastroesophageal anastomosis a little bit bigger than distance to esophageal stump to make a collar-shape structure (the perimeter of this collar shape structure was bigger than that of esophagus). Stomach wall surrounding gastroesophageal anastomosis was fixed. It is worth to mention that the stomach wall below gastroesophageal anastomosis should be fixed to the gastric stump (Figure 1C). 4. Gastric stumps were putted into cavity of tubular stomach and absorbable thread was used to close the stomach cavity (Figure 1D). The gastroesophageal anastomosis was putted back to esophageal bed. Stomach wall was fixed to top of the chest to reduce the tension of gastroesophageal anastomosis. Finally, the incision was closed. 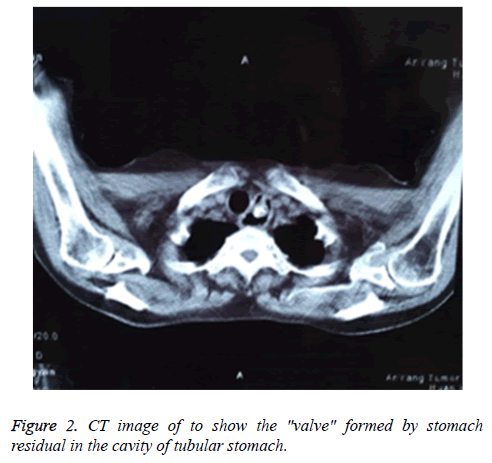 Patients in traditional treatment method was subjected to the same surgical treatment except that gastric stumps were not putted into cavity of tubular stomach and the perimeter of the collar shape structure was not bigger than that of esophagus. After surgery, patients were followed up for a year to monitor the occurrence of postoperative complications, and only 9 patients failed to complete the follow-up. All patients were subjected to esophageal angiography, gastroscopy and reflux investigation at 1 and 6 months after surgery. Diagnostic criteria of anastomotic stenosis: esophageal angiography showed the anastomotic diameter was less than or equal to 0.8 cm, with or without dysuria symptoms. Grading of gastroesophageal reflux: level 0, no reflux with semi-reclining position; level 1, postprandial reflux with semi-reclining position; level 2, fasting reflux with semi-reclining position; level 3, postprandial reflux with standing position; level 4, fasting reflux with standing position. All data were analysed by SPSS18.0 software (SPSS Inc., Chicago, IL, USA). Data of the normal distribution were recorded by (͞x ± s), and comparisons between two groups were performed b t test. Non-normal distribution data were processed by non-parametric Mann-Whitney U test. p<0.05 was considered to be statistically significant. Among 155 patients in traditional treatment group, anastomotic fistula was observed in 5 cases (3.4%), anastomotic stenosis was observed in 6 cases (3.8%) and gastroesophageal reflux was observed in 40 cases (15 cases of level 1, 14 cases of level 2, 9 cases of level 3, and 2 cases of level 4). In Geng’s treatment group, no anastomotic fistula was observed, anastomotic stenosis was observed in 5 cases (3.2%) and gastroesophageal reflux was observed in 2 cases (level 2, 1.3%). Significant differences in incidence of anastomotic fistula and gastroesophageal reflux were found between two groups (p<0.01), but no significant difference in incidence of anastomotic stenosis was found between two groups (p>0.05, Table 1). Table 1: Comparison of the incidence of postoperative complications between groups. The occurrence of postoperative complications has a long-term negative effect on patient with esophageal cancer. A recent study has shown that the five-year survival rate of patients received esophageal cancer surgery is significantly correlated with the incidence rate of major postoperative complications including sleep difficulties and gastroesophageal reflux . Therefore, postoperative complication prevention is the key in reducing the mortality rate of esophageal cancer. Anastomotic fistula, anastomotic stenosis and gastroesophageal reflux are three major types of complications that occur after esophageal cancer surgery [4,5]. In recent years, the inhibition of those 3 major complications has attracted more and more attentions in the field of the treatment of esophageal cancer world widely. However, based on our knowledge, no related study has been reported. Gastroesophageal anastomosis, which is usually performed after gastroesophagostomy during the surgical treatment of patients with esophageal cancer, is closely related to the occurrences of postoperative complications [6,7]. However, treatment efficacy of traditional astroesophageal anastomosis is not satisfactory due to the unacceptable high incidence of postoperative complications [11,12]. Based on our experience, 2.6%~6.4% of the patients will suffer from anastomotic fistula and about 4% of the patients will get anastomotic stenosis after gastroesophagostomy. For gastroesophageal reflux, the incidence rate is even higher. In our study, anastomotic fistula was observed in 5 cases, accounting for 3.4% of all the cases, anastomotic stenosis was found in 6 cases, accounting for 3.8%, and gastroesophageal reflux was observed in 40 cases, accounting for 25.8%. Results in this study were consistent with our experience. To reduce the higher incidence rate of complications, we developed Geng’s treatment for gastroesophageal anastomosis. In this novel method, anastomosis was not fully embedded, which may possibly inhibit the occurrence of anastomotic fistula. In addition, gastric stumps were putted into the cavity of tubular stomach to form a "valve" to reduce the reflux (Figure 2). Among 155 patients received this new treatment, no anastomotic fistula was observed, and gastroesophageal reflux was observed in only 2 cases, accounting for 1.3% of all the case. Significantly differences were found in the incidence rates of anastomotic fistula and gastroesophageal reflux between Geng’s treatment group and traditional treatment group (0% vs. 3.4%, p<0.01; 2.5% vs. 25.8%, p<0.01). However, no significant difference was found in the incidence of anastomotic stenosis between those two groups (3.4% vs. 3.8%, p>0.05). Therefore, further improvements are still needed to inhibit the occurrence of anastomotic stenosis. Figure 2: CT image of to show the "valve" formed by stomach residual in the cavity of tubular stomach. In conclusion, compared with traditional treatment, Geng’s treatment significant reduced the incidence of anastomotic fistula and gastroesophageal reflux. Therefore, this method should be popularized in clinical practice. Zhang Y. Epidemiology of esophageal cancer. World J Gastroenterol 2013; 19. Mariette C, Dahan L, Mornex F. Surgery alone versus chemoradiotherapy followed by surgery for stage I and II esophageal cancer: final analysis of randomized controlled phase III trial FFCD 9901. J Clin Oncol 2014; 32: 2416-2422. Lerut T. Carcinoma of the esophagus and gastro-esophageal junction. Surgical Treatment 2001. Ding G, Chen S, Tang W. The effect of semaphorin 5A on invasion and metastasis of gastric cancer. Pract J Cancer 2013; 1: 19. Palmes D, Weilinghoff M, Colombo-Benkmann M. Effect of pyloric drainage procedures on gastric passage and bile reflux after esophagectomy with gastric conduit reconstruction. Langenbecks Arch Surg 2007; 392: 135-141. Hayata K, Nakamori M, Nakamura M. Circular stapling versus triangulating stapling for the cervical esophagogastric anastomosis after esophagectomy in patients with thoracic esophageal cancer: A prospective, randomized, controlled trial. Surgery 2017. Wang Q, Liu J, Zhao X. Can esophagogastric anastomosis prevent gastroesophageal reflux. Zhonghua Wai Ke Za Zhi 1999; 37: 71-73. Romeo E, Foschia F, de Angelis P. Endoscopic management of congenital esophageal stenosis. J Pediatr Surg 2011; 46: 838-841. Chen KN. Managing complications I: leaks, strictures, emptying, reflux, chylothorax. J Thorac Dis 2014; 6: 355. Derogar M, Orsini N, Sadr-Azodi O. Influence of major postoperative complications on health-related quality of life among long-term survivors of esophageal cancer surgery. J Clin Oncol 2012; 30: 1615-1619. Aslam V, Bilal A, Khan A. Gastroesophageal anastomosis: single-layer versus double-layer technique--an experience on 50 cases. J Ayub Med Coll Abbottabad JAMC 2007; 20: 6-9. Ighor S, Stanislav K, Olena K. P-0078modified Gastroesophageal Anastomosis In Proximal Gastrectomy. Ann Oncol 2014; 25: 37-38.